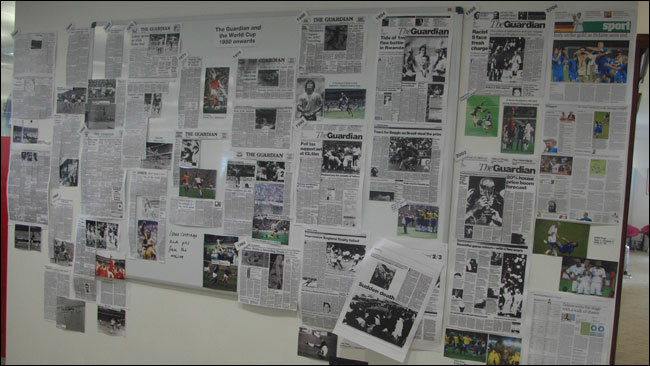 The Guardian's "Wall of World Cup Archives"
Throughout the course of this summer's World Cup, at The Guardian we had a display of archive coverage of the tournament up in the newsroom. Put together by Richard Nelsson and his library and archives team, it covered the years 1950 to 2006. Two things really stood out for me. Firstly, how little the design and layout of the Manchester Guardian / Guardian had changed from the 1950s to the 1980s. And secondly, how sports coverage - particularly the volume and importance of it - had drastically altered during that time. 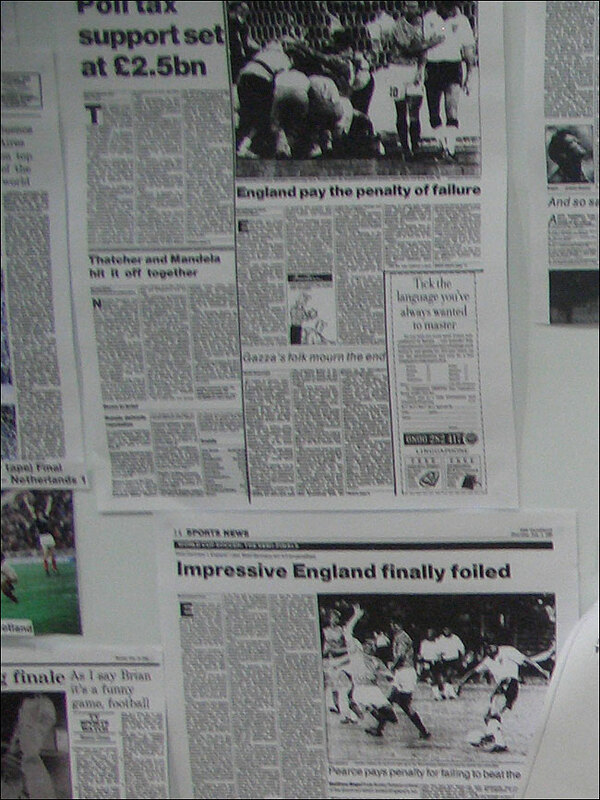 In 2010, drawing with a USA team that were ranked just a few places below England generated acres of newsprint and a mood of national crisis. 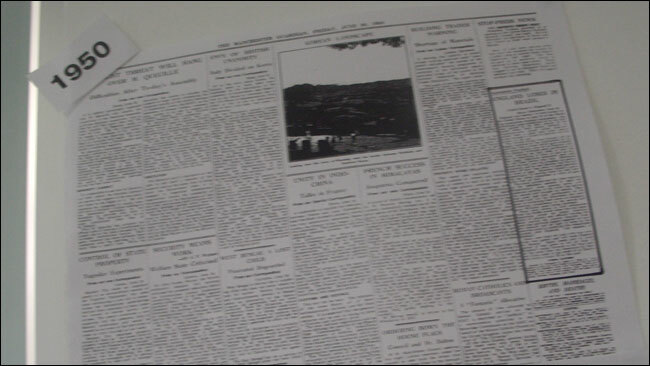 In 1950, for the Manchester Guardian, a genuinely shocking England-USA result merited about a third of a column of news - the article with the felt-pen outline around it in this image. 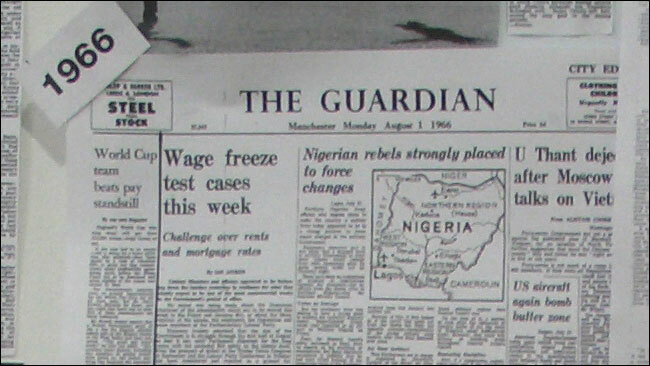 Even in 1966, when England had just secured the Jules Rimet trophy at Wembley, the Guardian was leading with issues in Nigeria, and framed the England victory through the prism of wage demands. Inside, however, there was some rather more jubilant picture-led coverage. 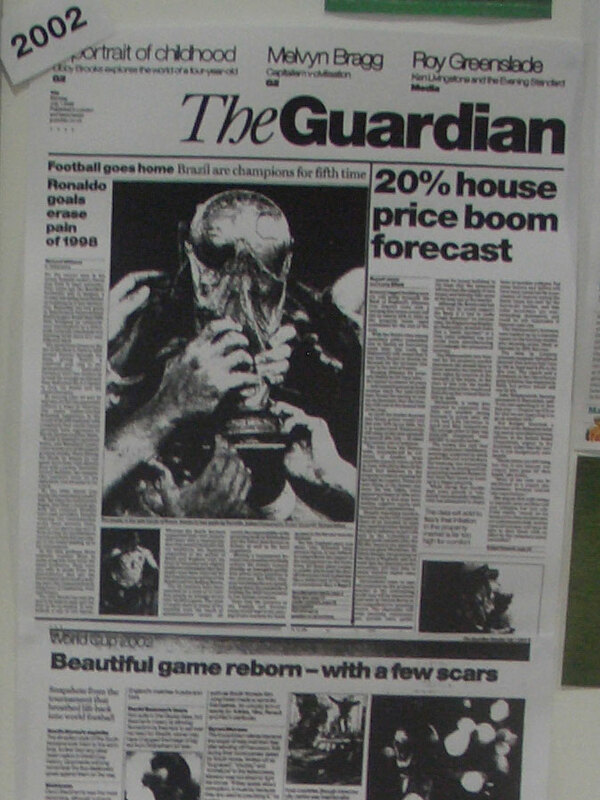 The next time England got anywhere close to the World Cup Final was in 1990, and by then football was important enough to get a picture lead on The Guardian front page. In 2002, rather than focus on an individual player, the image chosen was many Brazilian hands on the World Cup, an image now being echoed with the logo for the 2014 edition of the tournament to be held in Brazil. The 2006 World Cup coverage looks familiar to us today. The Berliner format had only been adopted the September prior to the World Cup, and our football stats still follow the same basic design as illustrated with this print-out of analysis of the final between Italy and France. 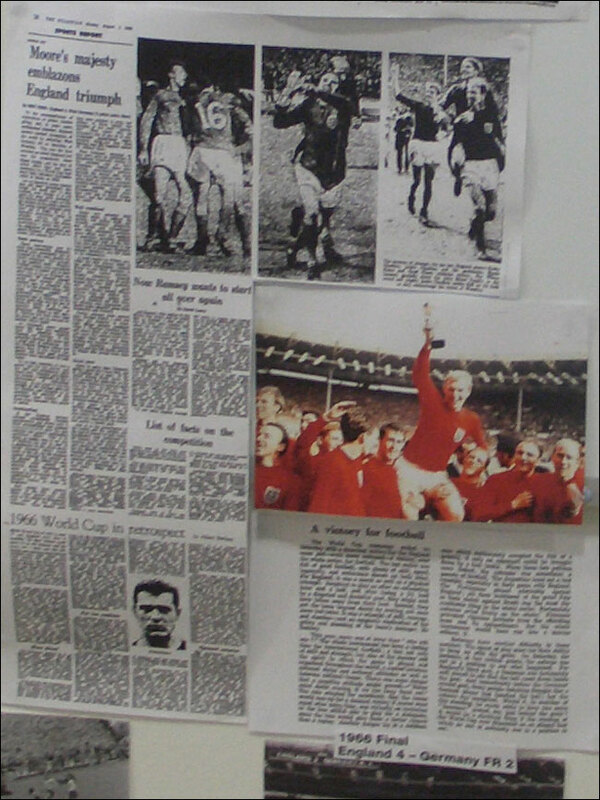 The 'World Cup wall' only went back to 1950, missing out on the first three editions of FIFA's tournament in the 1930s. There doesn't seem to have been much to print out if you'd gone back that far into the archives anyway. 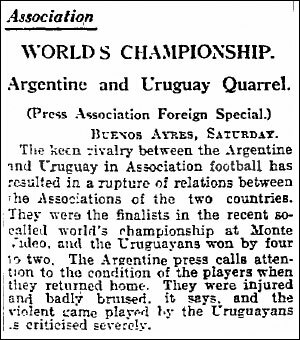 The closest I could find in the online Digital Archive to a report of the first World Cup in 1930 was this short piece from August 4th. 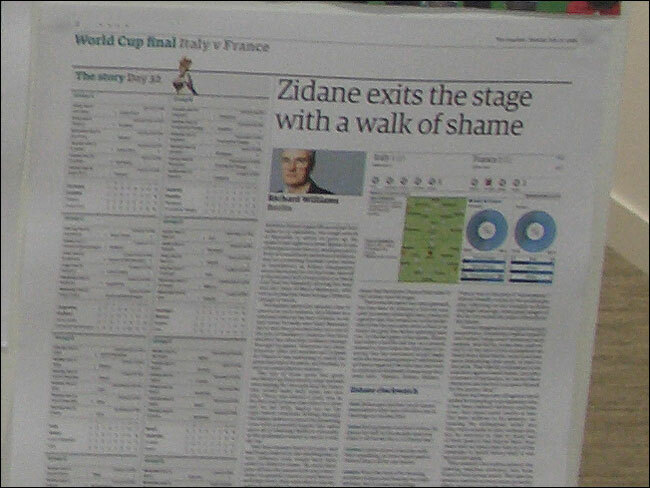 It was 5 days after the final, and credited as a 'Press Association Foreign Special'. Filed on the Saturday, and published on the Monday, it told of how the Argentinian team had returned home from the "so-called world's championships" complaining about the rough physical treatment meted out to them in the final. 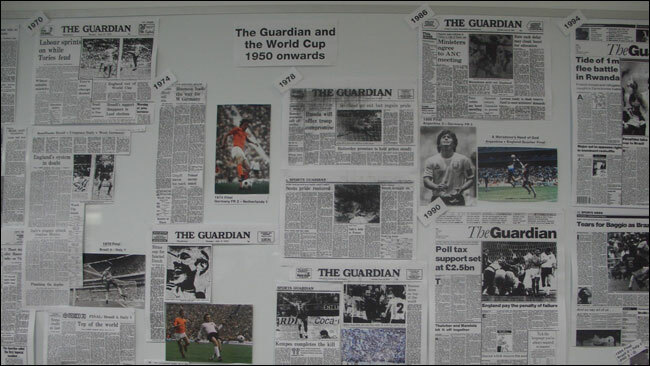 Seeing all of this archive material on the wall made me wonder about how the digital content associated with the last couple of World Cups has been archived at The Guardian, something I'll return to in a future blog post. By Martin Belam on 21 July 2010.